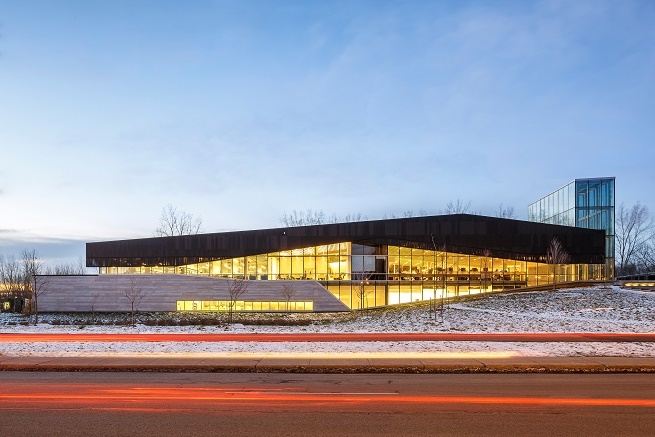 OTTAWA, April 11, 2017 – A public library in suburban Montreal that combines high-performance standards with design quality and responsiveness to community needs will receive the 2017 Green Building Award. The award, given by the Royal Architectural Institute of Canada (RAIC) and the Canada Green Building Council® (CaGBC), recognizes outstanding achievement in buildings that are environmentally responsible and promote the health and wellbeing of users. “The library offers a variety of beautifully lit and welcoming spaces throughout, maximizing daylight and views and the use of natural elements, such as wood, to create an environment that contributes to health and wellbeing,” said the three-member jury. “Their approach to high-performance building through whole systems design and strategy has resulted in an impressive achievement. The award will be presented at the RAIC/OAA Festival of Architecture which takes place May 24 to 27 in Ottawa. Winner of multiple national and international awards, the LEED® Platinum certified building covers 6,000 square metres and brings together multiple functions: a library, administration, exhibit space and museum archives. The result of an architectural competition by the City of Montreal, the library contains a large collection to serve an ethnically diverse area. It includes meeting rooms, youth areas, and a café, and aims to provide an attractive space for learning and cultural and community activities. Sustainability strategies include an innovative integration of mechanical systems: a passive heating system uses the heat accumulated in a glass prism for redistribution through a geothermal loop. Low-flow ventilation through the floors reduces the number of ducts required. The building relies mostly on natural light, combined with task lighting, for energy savings: 75 percent of the library’s floor area receives natural light. The project emphasized the use of certified wood, low-emitting materials, and recycled or regional materials. On the exterior, the project preserved trees and planted over 100 new ones, as well as adding 5,000 shrubs, ground cover, and climbing plants, all of them indigenous. A storm water recovery system supplies water to an adjacent wetland. Shafraaz Kaba, MRAIC, partner, Manasc Isaac Architects, Edmonton. The CaGBC is the leading national organization dedicated to advancing green building and sustainable community development practices. As the voice of green building in Canada, they work closely with our national and chapter members in an effort to make every building greener. CaGBC is the license holder of the LEED green building rating system in Canada and is developing the country’s first Zero Carbon Building Standard, supports the WELL Building Standard and GRESB in Canada, and oversees the Canada Coalition for Green Schools.